The psychological and physical process by which a painter creates his art becomes a highly theatrical, and for the most part, absorbing 90-something minutes in this acclaimed London import. 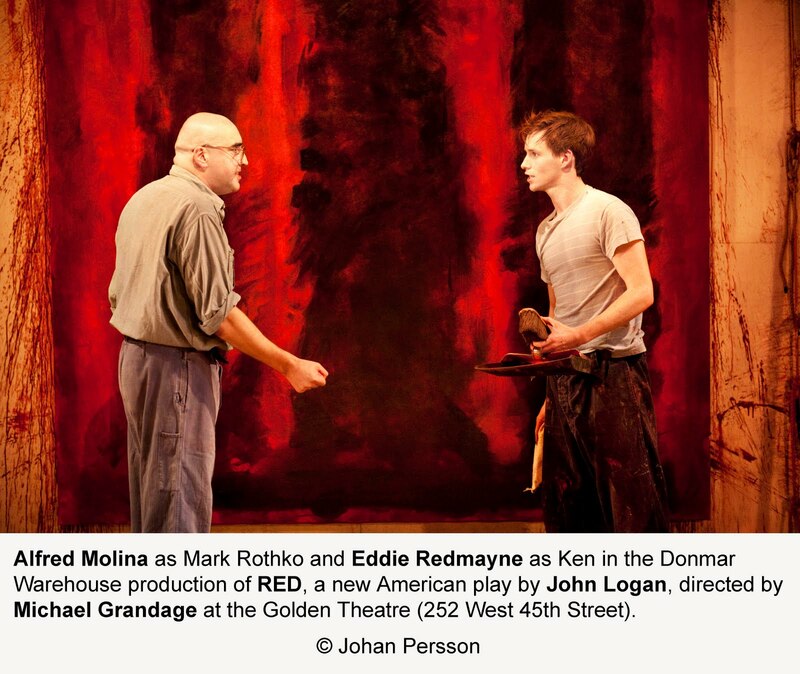 Though at times dense, the play by John Logan (an American) is full of intriguing ideas about art and commerce, and is grounded by two terrific performances – Alfred Molina as the pompous and self-absorbed abstract expressionist Mark Rothko and Eddie Redmayne as his (fictional) assistant Ken – while an imaginative staging makes the mechanics of art – the mixing of the paint, the stretching of the canvas, etc. – especially vivid. 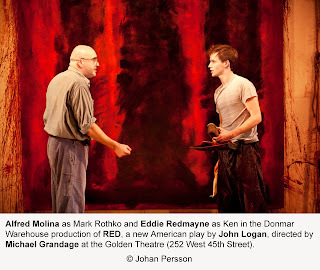 Directed by Michael Grandage, last represented on Broadway with the Jude Law “Hamlet,” the play opened at London’s Donmar Warehouse last December. The action covers more or less a two-year period beginning in 1958 when Rothko was commissioned to paint a series of murals for the posh Four Seasons in restaurant in Philip Johnson’s Seagram Building for the then unprecedented fee of $35,000. Is Rothko – the great exponent of pure art -- selling out? Is he kidding himself that he’ll be able to create a truly rarefied environment around all the high-rollers dining beneath his work? Rothko, obsessed by tragedy, fears the encroachment of the black on his painting; he’s disturbed by the absence of light and sees it “swallowing” the life-affirming red, which serves as the play’s leitmotif. The artist is so egocentric he hasn’t bothered to learn anything about the highly proficient and articulate young man assisting him. Ken is, in fact, an artist himself (and in a sense, represents the encroaching new generation that Rothko so deplores). Rothko takes no interest in seeing his Ken’s work. “I’m not your father,” he tells Ken scornfully throughout, but in fact, mentor and pupil is precisely the dynamic at play here. Rothko badgers him about not knowing Nietzsche, Shakespeare, Freud, Jung, and any number of other literary giants he believes to be an essential foundation, and mocks pop artists like Andy Warhol who paint for the moment. Inevitably, Ken explodes, and challenges Rothko on his status in the art world, and his vaunted superiority. Rothko only wants intelligent people to view his art. Is there anyone, in fact, smart enough to understand that art, Ken challenges? It is this confrontation that finally kicks the play into high gear, and thereafter remains spellbinding to the end. Molina’s American accent is superb, and his portrayal powerfully austere and commanding, a real force of nature, and yet a deeply troubled man. And it’s rather fascinating to observe Rothko coming to the studio dressed like a businessman each day, before changing to his paint clothes. Redmayne – who won the Supporting Actor Olivier Award for this role – makes a worthy acolyte and sometime adversary, with a convincing Yank accent, too. Christopher Oram’s set – apparently a replica of Rothko’s actual dimly lit studio which had been converted from a gymnasium – is wonderfully evocative, and it’s well utilized by Grandage who stages the changing of canvasses, and the pulley system used to hoist them, to create visual variety. Neil Austin’s lighting is impeccable in that regard, also. Adding immeasurably to the overall effect is the astute use of music. 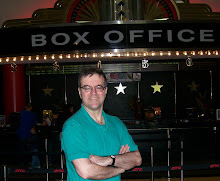 Adam Cork has composed a dramatic, haunting score, and has designed the sound for the play’s “natural music,” a phonograph player which gets a good workout from Rothko and Ken are as they change the records to suit their mood, while creating art: Rothko, favoring classical, Ken, Chet Baker. The climactic musical and dramatic moment is the thrillingly theatrical sequence of the pair furiously priming a canvas with (what else?) red paint, from top to bottom and side to side, while a classical record blares, until the white area is completely obliterated, leaving teacher and apprentice utterly exhausted, and the audience exhilarated.